SAP BusinessObjects Web-Intelligence is one of the most powerful reporting tools available in the market today. We do not need a slide with list of logos of the customers using this tool. Without a doubt, it is evolving constantly to meet the current market needs (see what’s new in BI 4.2 SP5 released this month). Sometimes we need more functionalities than what a classic and powerful reporting tool could offer, something like predictive and planning. SAP analytics cloud is a next generation all-in-one analytics SaaS solution that combines reporting planning as well as predictive. Here we’ll see some scenarios where your business could benefit from a hybrid model by leveraging the functional richness of Web-Intelligence and the exceptional user experience provided by SAP Analytics cloud at the same time. Classic/Enterprise Reporting: Business user uses SAP BI Launchpad to view and interact with the report. Reports are linked using OpenDoc from portals including SAP and MS SharePoint. Continue as is. Leverage new Fiori BI Launchpad. Ad-Hoc reporting: the power user uses a base report or Creates his own report from scratch using universe or BEx query or Hana view or any other supported data source. Continue as is. Report Bursting: the report is sent to hundreds or thousands of users as PDF so that they have an offline copy of the report. Continue as is. Report Scheduling (Web-i Format): in situations where the report refresh times are longer, a report can be scheduled (default enterprise location) and optionally can be sent to users’ BI inbox as well. Continue as is. See the new scheduling experience in Fiori BI Launchpad. Continue as is. Leverage new Fiori BI Launchpad. Report Scheduling (Flat file formats): The report is scheduled and the output is in Excel or csv format . This raw data is further used in data downstream activities. Mobile Access: Simple reports that could to viewed on mobile devices. For the first 4 use cases, continue using SAP BusinessObjects Web-intelligence. It is also recommended that you update to the latest version of BI platform (which is BI 4.2 SP5 currently) to benefit from the enhancements that have been delivered with these new releases. Check out the useful links towards the end of this document for more information. There are situations where the report data is exported as a csv or excel file and then used for reporting again using another tool. There is no real value add that we would get just by creating a better-looking visualization. But what if you could do more? Using SAP analytics cloud agent and SAP cloud connector the data can be pushed from a sftp location to SAP analytics cloud model. The high-level integration is described below. Once the data is imported into SAC, you could use all functionalities including Smart Discovery and planning. Also, note that you can leverage your custom destination configurations including Google BigQuery, Google Drive or OData integrators. 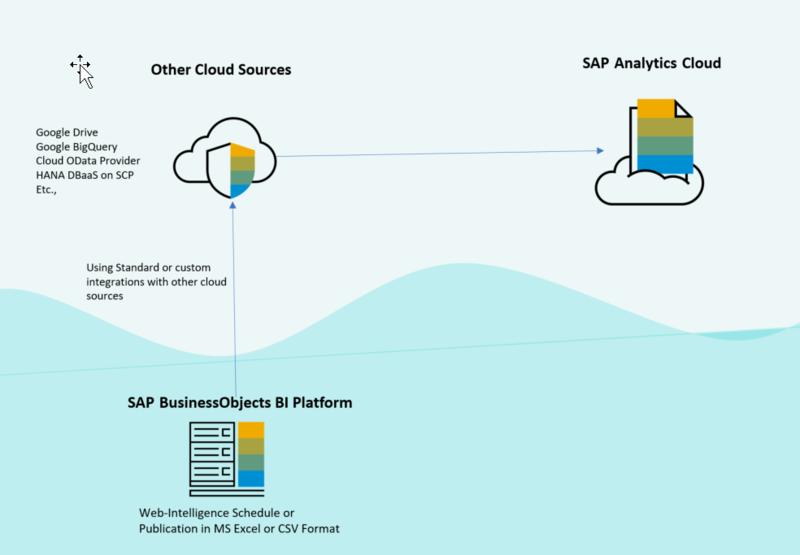 It is simple to mobilize the stories (and Boardroom agendas) created using SAP Analytics Cloud using the data from SAP BusinessObjects Web-Intelligence with any of the “import” data approaches explained above. 1. While designing a story, make sure you choose responsive layouts to make the story available on mobile devices. 2. The mobile app supports collaboration. 3. Currently Supported on iOS devices (iPhone and iPad). 4. Input controls and filters are supported. 5. Offline support is limited to what is already cached. For mobile first or mobile only use cases, SAP Roambi would be the favorite choice currently as it offers full offline capabilities and supported on wide range of Mobile Operating Systems. Also, note that there is an out of the box integration with SAP BI Platform Publication (Roambi Publication plugin) to push data to SAP BusinessObjects Roambi cloud. It is possible to embed a SAC story in any SAP or non-SAP solution. Since this is cloud based solution, it is an ideal fit for cases where your story/report needs to be shared outside of your corporate network (like sharing reports with vendors, suppliers or with any third parties). See URL API under useful links. On the other hand, you could embed a web-I report in SAP Analytics cloud as HTML page. 1. As the output format of the web-I schedule is HTML archive, interactivity (like, filtering, input controls, commentary, etc.,) is lost. 2. Suitable for cases where run-time or view-time data security is not involved. It is the same case with any other export formats like Excel or PDF. The advantage being the format is preserved and you need not configure additional authentication as this is disconnected from SAP BusinessObjects BI Platform. 3. The site on which you plan to host the web-I report (as HTML site) should be accessible from SAC and it should allow embedding. 4. On SAC side, it is very simple to use the “Web Page” widget to embed the HTML page. 5. As you could schedule the Web-I report (in HTML Archive Format), you could make sure that the users are seeing the latest information without manual intervention. It is possible to access UNX in Live and Import modes from SAC. The functionalities supported within SAC depends in the mode that you have chosen. For example, planning is not currently possible when you connect to UNX in Live mode. Also note that the query panel in Web-I is very advanced and offers lots of other functionalities that what is available in SAC today. The data is stored in internal local database (microcubes). 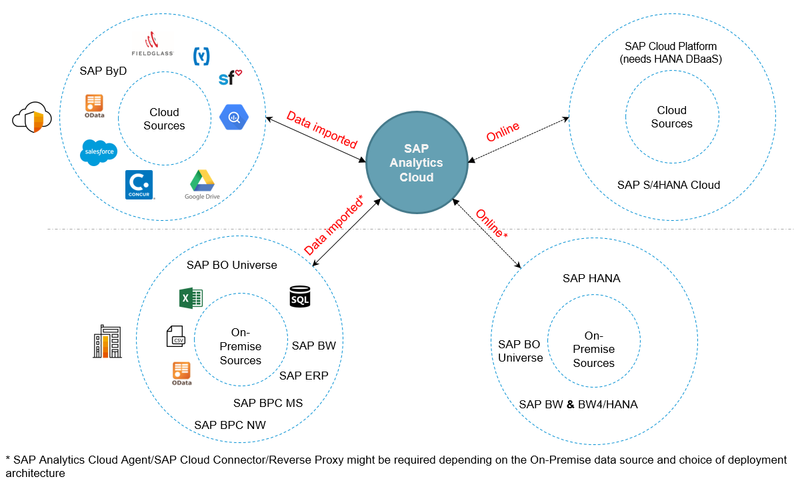 Nice blog which in my opinion highlights that reusing WebI content use cases are very limited and SAP should think very clear about any hybrid support for SAP Analytics Cloud. Why keep an intermediate layer to push data into a SAC model if the data sources is probably directly accessible from SAC?